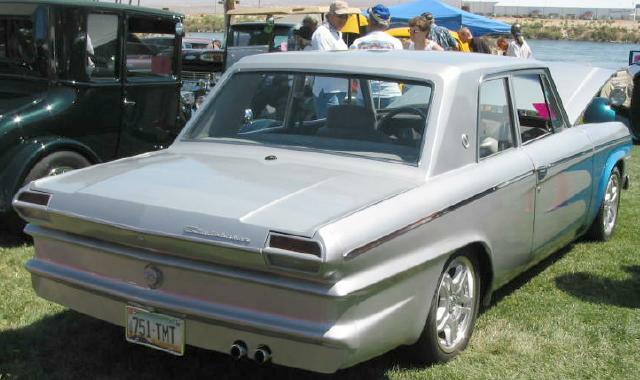 Bill Junge of Lake Havasau City, Arizona sent in these pictures of a cool 1964 Studebaker Commander Street Rod owned by Layton Frost, also of Lake Havasu City. The pictures were taken in June 2007 at a car show in Laughlin, Nevada. Bill indicates that Layton's car sits on a late model General Motors chassis, has a transverse mounted engine, and is front wheel drive. The under the hood picture above was taken from the front of the car clearly showing the side-to-side orientation of the engine. 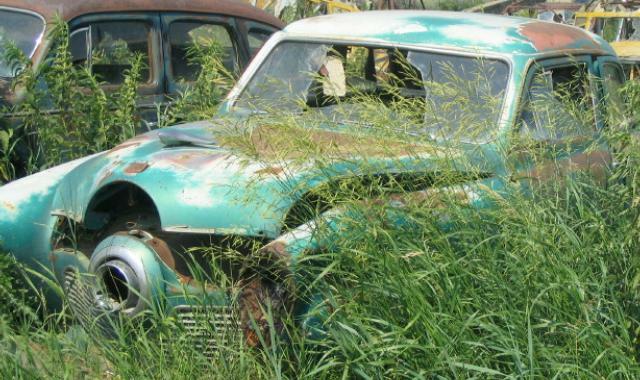 This may be the world's only front wheel drive Studebaker! 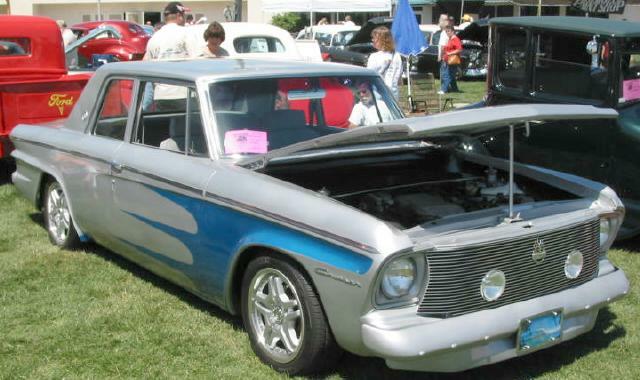 Only 8,315 Studebaker two-door sedans were produced for the 1964 model year so this a a relatively rare car. Layton's car has a "Cruiser" script on the front fender but the Cruiser was only availble as a four-door sedan. The rest of the trim is Commander level trim. Two-door and four-door sedans also came as stripped-down "Challenger" models which were devoid of almost all brightwork. The Challenger was a 1964 only model and was discontinued when production shifted to Canada. Thanks to Bill for sending in the pictures and information about this interesting custom Stude. 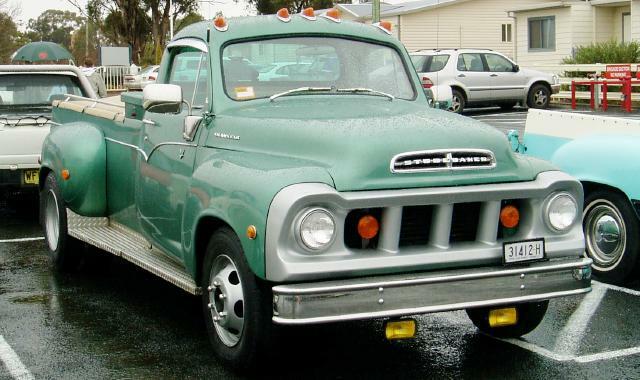 This sharp 1963 Studebaker One Ton Pickup belongs to Dave Meagher of Sydney, Australia. Dave's heavy duty truck sits on a 131" wheelbase and is powered by a Studebaker 289 cubic inch V8 with a New Process 5-speed manual transmission. Carroll Studebaker of Brookville, Ohio started restoration of the truck in the mid-90's and subsequently sold it to Dan Juhl of Dayton, Ohio who completed the restoration. Dave bought the truck at the 2004 International Meet in Charlotte, North Carolina and imported it to Australia. 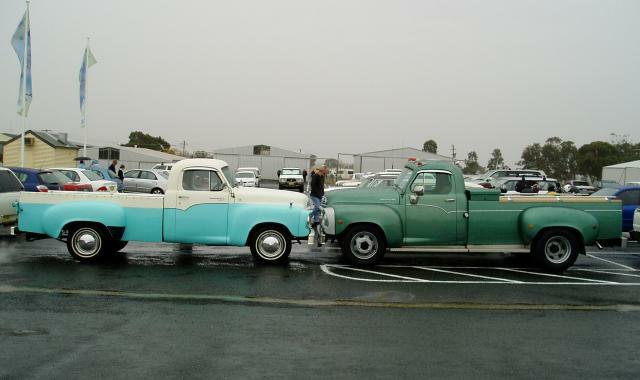 This picture shows Dave's truck with its 9' bed and Steve Leyden's 1957 Transtar Deluxe Pickup which has an 8' bed. As can be seen in the picture, the difference in bed length is between the cab and the rear fenders. Steve's truck was the August 2007 Stude of the Month. Thanks to Steve Leyden for sending the pictures and information. 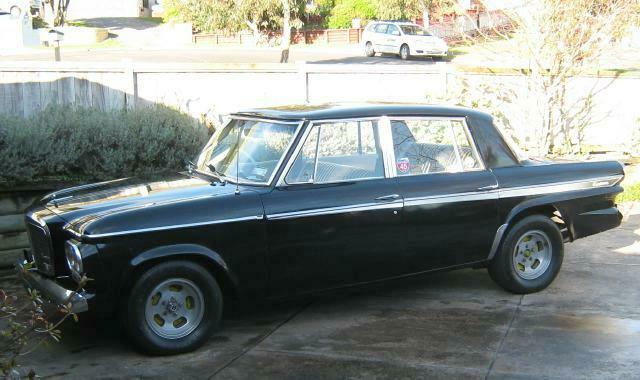 Continuing with the bottom "side of the world" theme, Carey Hill of New Zealand sent this picture of a 1963 Studebaker Lark Cruiser that he has owned since 1972. 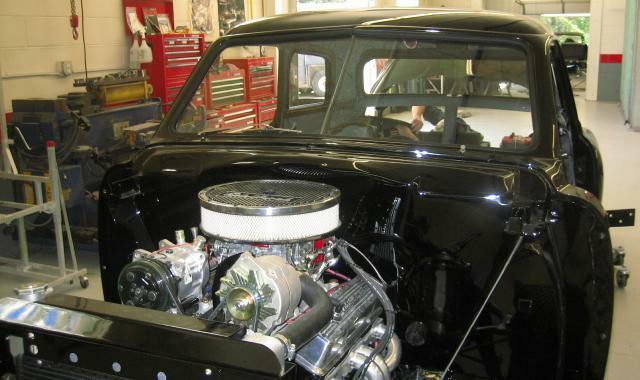 Carey's car has a number of performance modifications including a bored and balanced Studebaker 289 V8 with "quite a cam grind" and an Edelbrock manifold with a four barrel carburator. It also is equipped with modern wheels and tires, a four-speed manual transmission, and dual exhausts. Carey says that it goes surprisingly quick and that he enjoys surprising the drivers of more modern performance cars by leaving them in the dust. Thanks to Carey for sending the picture and information about his car. 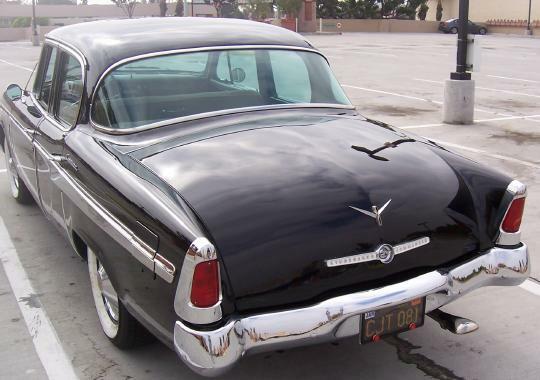 This sharp 1955 Commander Sedan belongs to Gary Gabriel of Glendale, California. Gary is the second owner of this car, which he acquired from the original owner's son in May 2005. Gary's Commander is an early 1955 Regal model with a non-wraparound windshield. 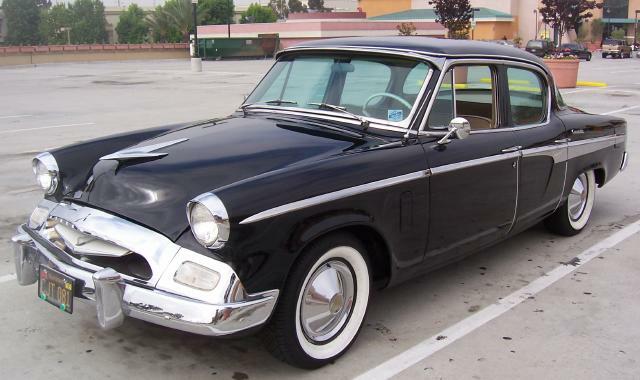 Studebaker introduced the 1955 "Ultra Vista" sedan models with a wraparound windshield as a mid-year change. Gary's car is powered by a 224 cublic inch Studebaker V8 rated at 140 horsepower and has a manual transmission with overdrive. 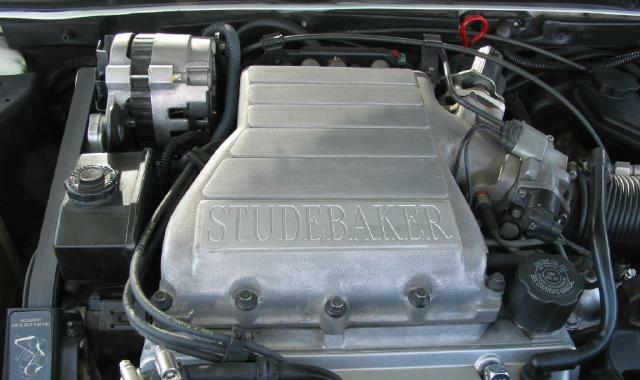 Studebaker also changed the Commander V8 engine mid-year to 259 cublic inches and 162 horsepower. 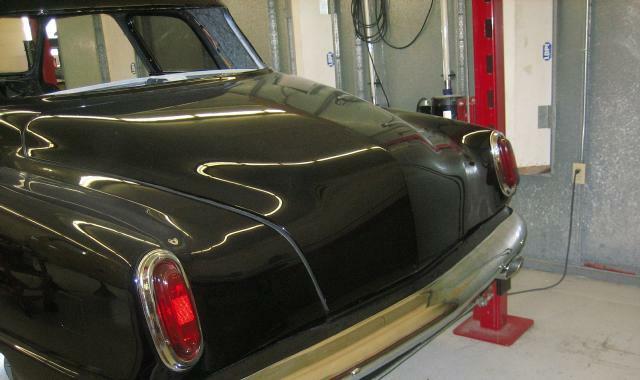 Gary's car is an original rust free California car that has been fully restored down to every nut and bolt. Gary likes his Commander and drives it several days a week but he would love to have a 1955 President Speedster if anyone is interested in a trade. Here is a rear view of Gary's Commander. 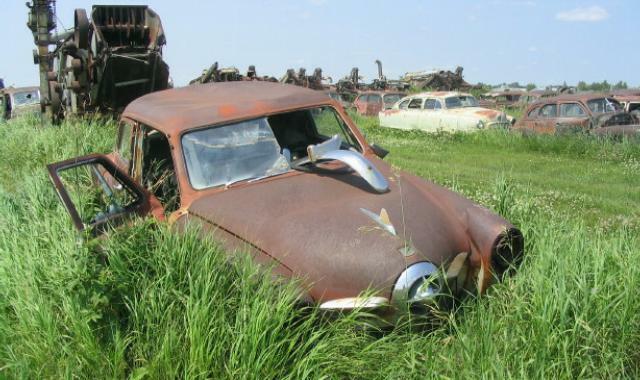 Bill Junge sent these pictures of several bullet nose Studebakers rusting away in a wrecking yard on the Canadian plains. The pictures were taken by Phil Smith who lives in the Calgary, Alberta area. The 1950 models are distinguished by a chromed metal bullet with thick chrome surround and a two-piece windshied. The 1951 models have a silver painted plastic bullet with a painted surround and a one-piece windshield. It has been some time since graveyard pictures were featured on this page, so it was nice to have some new ones. Thanks to Phil for taking the pictures and to Bill for sending them. 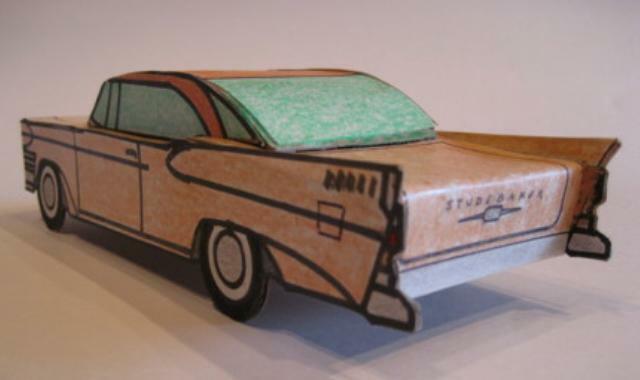 Mark Crowel of Mattawan, Michigan sent some additional pictures of cardboard Studebaker models that he designed and constructed. 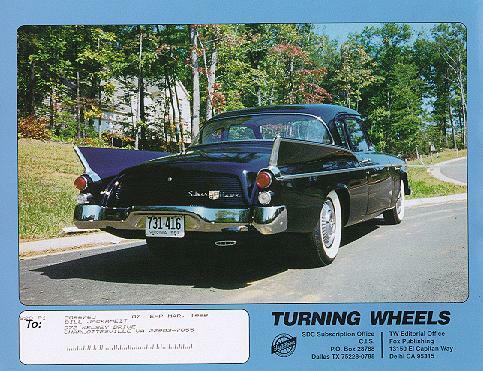 Several of his Studebaker models appeared on this page in June 2007. 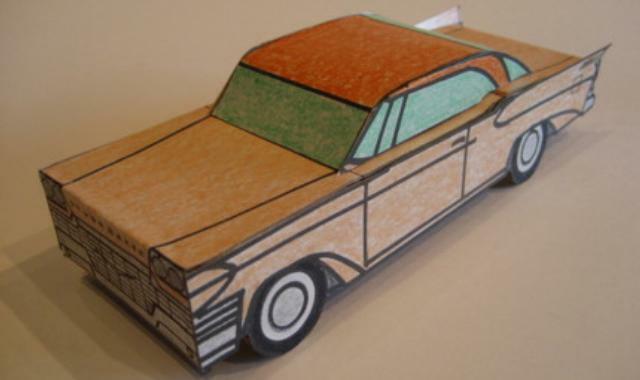 Mark has written a book, Introduction to Homemade Model Cars, to guide those who wish create their own cardboard models. 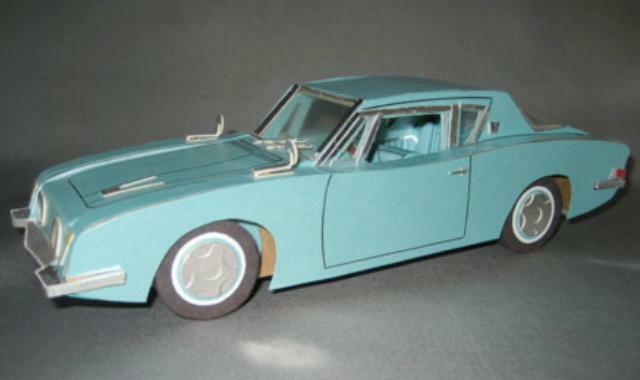 The book is available on his Papercraft Model Hobby Books web site. He says that this business is a natural culmination of a passion for model cars combined with a lifelong enjoyment of building things with cardboard. Here is a top view of the Avanti which features a detailed interior. Thanks to Mark for sending the pictures and information. 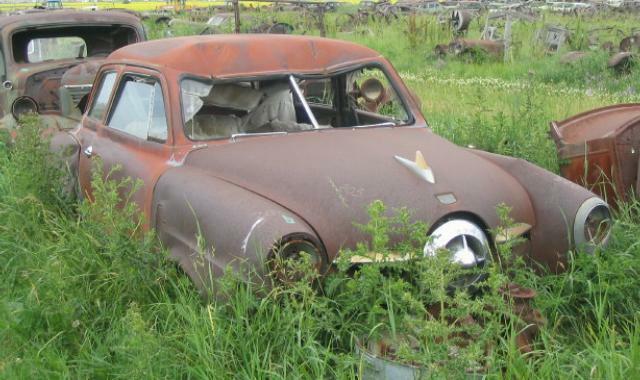 Lennie Broich sent these pictures of a 1950 Studebaker Street Rod that he is building. He expects to complete the car by December of this year as a Christmas present for his wife. Lennie says that she wanted a fun car, so this is what she will get! The front windshield has been V-butted and the rear window has been changed from the two-piece 1950 type to the one-piece 1951 type. The rear deck has been cleaned up and oval exhaust tips have been added under the rear bumper. 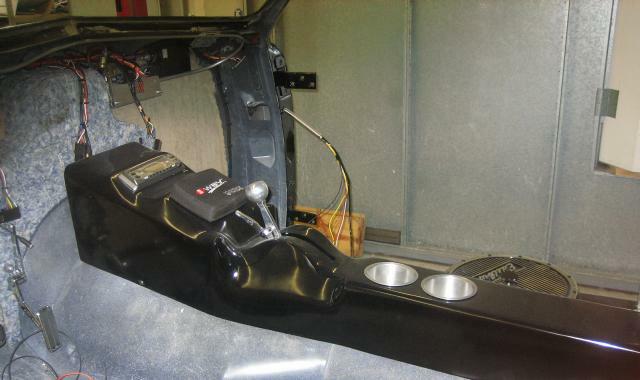 Here is a picture of the custom built center console with auto shifter, cup holders, and audio system. Hopefully, we will see the final result of Lennie's labors on this page at a future date. 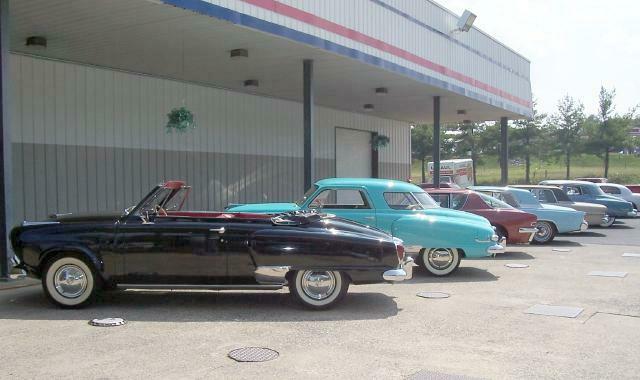 These Studebakers are parked in front of the Eavers Classic Cars & Collectibles Museum in Mint Spring, Virginia. The car in the foreground is Chester Bradfield's 1951 Commander Convertible, followed by my 1949 Champion Starlight Coupe, Randy Nesselrodt's 1978 Avanti II, Gene Kane's 1962 GT Hawk, Phil de Vos's 1965 Daytona Sport Sedan, and Melvin Wampler's 1950 Land Cruiser. 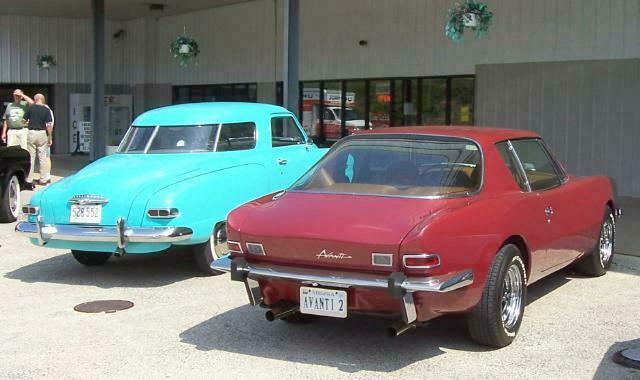 The second picture shows a rear view of the Avanti II and the Starlight Coupe. These two were the newest and oldest cars making trip. The Eavers Museum features a number of early Corvettes, numerous American muscle cars, and other interesting vehicles from the 1950's, 1960's, and 1970's. These include a 1959 Devin, a genuine 1965 AC Cobra, and the last Cadillac purchased by Elvis Presley. Weaver's Mercantile, an authentic turn of the century county store, is incorporated into the museum and is also worth a look. The Studebakers belong to members of the Central Virginia and Greater Virginia Chapters of SDC. 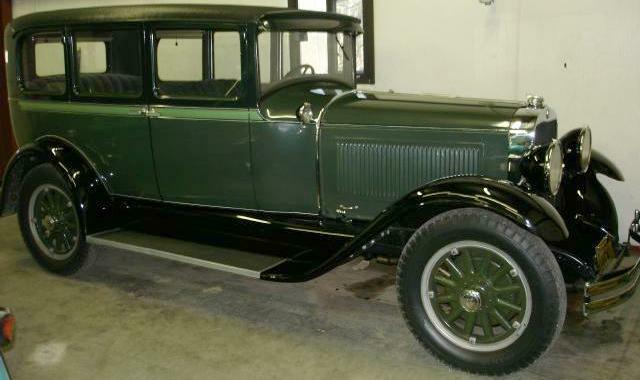 John Black of Winchester, Virginia and Lakeland, Florida sent in this picture of his 1928 Studebaker Commander 4-Door Sedan. John's car is powered by the 354 cubic inch displacement Studebaker "Big Six" which produces 85 horsepower in this application. The only accessory on the car is a hot air heater. Commanders of this period set a number of speed and endurance records. Prehaps the best known was in October 1927 in Atlantic City, New Jersey when three Commanders travelled over 25,000 miles in under 25,000 minutes. John says that he has fixed all the mechanical items and that he is thinking of having the paint refreshed only as needed. The contrasting color stripe at the beltline is a feature that Studebaker used on a number of models in the 1930's and early 1940's. John indicates that the car is at its best climbing hills and travelling on back country roads. 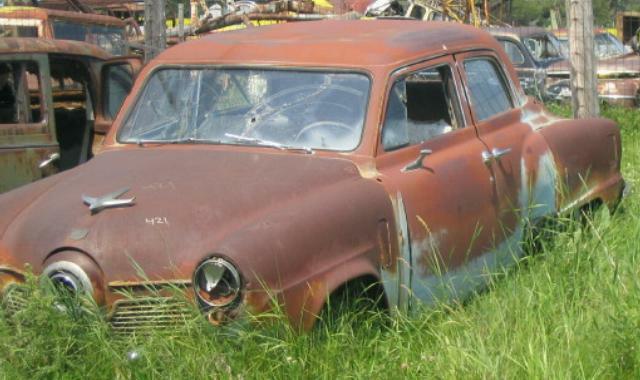 Thanks to John for sending the picture and information on this interesting antique Studebaker. 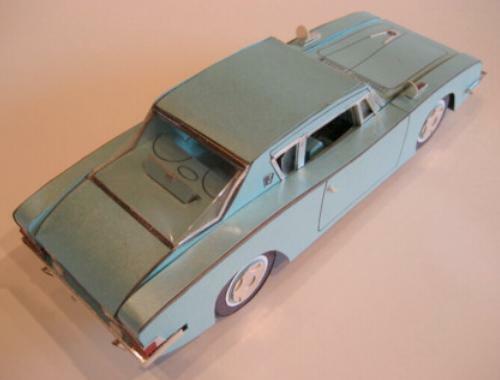 Mark Crowel also sent these pictures of an AMT 1955 Studebaker promotional model that he bought at a toy show for $20. This example has some warping, which is common on these models, and is missing its clear plastic windows. Still, it was a great buy for $20. Here is a rear view of this relatively rare model. More toy Studes can be found in the Stude Stuff area of this page and on my Studebaker Toys Home Page.